25/03/2019 - Macrophyte plants are in the establishment period. 7/11/2018 – Construction is finished and macrophyte planting is complete. 8/8/2018 – Construction continues with the laying of the foundation for the gross pollutant trap (GPT). 9/8/2018 – Bird netting will be installed in August in preparation for spring planting. 16/10/2018 – Civil construction nearing completion. Site fences will soon be removed and macrophyte (water plants either in or around the wetland) planting will commence. 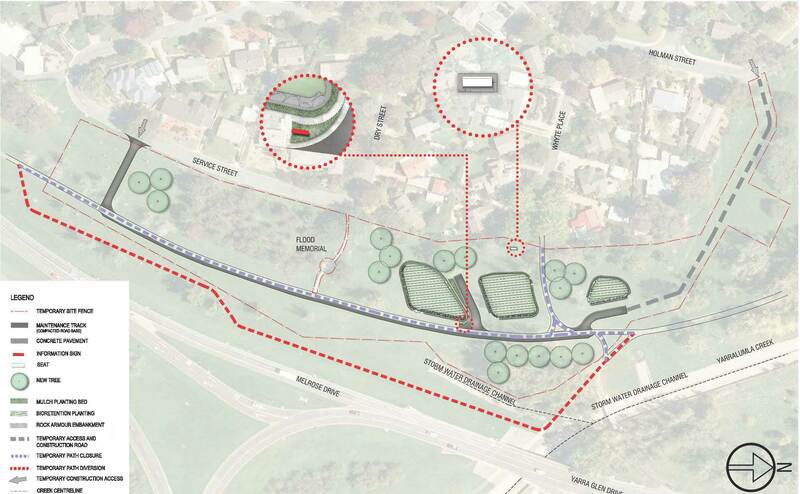 A new rain garden in the open green space around the Flood Memorial site in Woden will play a role in improving water quality in Yarralumla Creek and add to the commute for the many cyclists who use the nearby bike path every day. Dry most of the time, a rain garden looks just like a garden on the surface but has a storage and filtration structure underground to reduce the amount of harmful nutrients in stormwater. Water will be diverted from existing underground stormwater drains, with the treated water returned to Yarralumla Creek which, in turn, flows into the Molonglo River. During major storm events the maximum water depth will be 30cm. Dense planting will deter people, including children, from entering the water. Some deciduous trees will be removed but they will be replaced by evergreen trees to limit autumn leaf drop, so harmful to our waterways. A 250m length of existing cycle way will be widened from 2.5m to 4m. 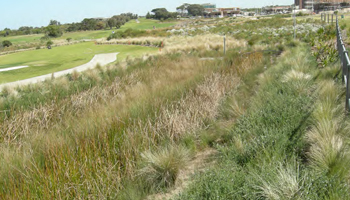 Careful design has ensured that the size of the rain garden is proportionate to the amount of available water during low-flow periods, making it as efficient and cost-effective as possible. +Construction may be delayed by a number of factors, including bad weather. ^The establishment period may change depending on ground and weather conditions. During the establishment period, flows into and through the asset will be managed to suit the conditions and to protect and nurture the plants. *Some areas of the site may remain closed to allow for plants to establish. Although water quality is the priority for ACT Healthy Waterways, the project team is also working to a fixed budget and timeframe. During the final design phase, some changes were made to the original concept designs to avoid the need to relocate an array of underground utilities and services and to limit the removal of established trees. The size and configuration of the rain garden evolved to protect the existing Flood Memorial, avoid underground services and protect existing trees. Although the total treatment area was reduced by approximately 50 per cent, potential pollutant reduction per square metre increased, making it more efficient and cost-effective. An enlarged in-ground Gross Pollutant Trap (GPT) replaced the proposed sediment forbays freeing up space for the rain garden. The southern cell was split to avoid the realignment of a stormwater pipe. Underground high voltage cables will be relocated. Find out what you can do on your own block to improve water quality in our lakes and waterways. Get updates about Healthy Waterways projects sent straight to your inbox. Sign up to the H2OK email newsletter. Detours for walkers and cyclists will be in place and will be clearly signposted. The construction site will be fenced for public safety during the entire length of the project. The contractor has prepared a Construction Environment Management Plan (CEMP) to detail how it will deal with flora and fauna issues.